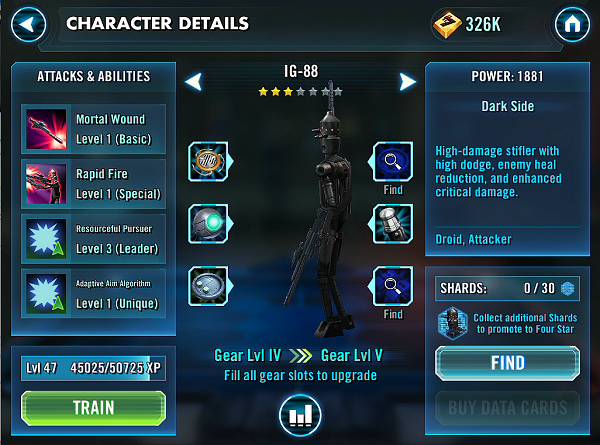 IG-88 is an assassination droid that can inflict anti-heal debuff and deal AoE damage. This brief guide will give you a rough idea of what he has to offer to your team. Basic Ability: Mortal Wound – Deal Physical damage to target enemy with a 60% chance to inflict Healing Immunity for 2 Turns. Unique Ability: Adaptive Aim Algorithm – IG-88 has +45% Critical Damage and deals 20% more damage for each enemy suffering a negative status effect. 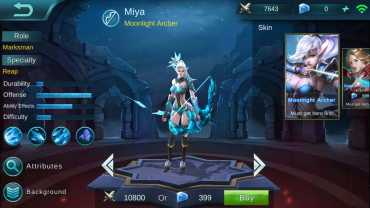 Leader Skill: Resourceful Pursuer – All allies gain 20% Critical Chance. IG-88 is one heck of a great debuffer and damage dealer. He can inflict anti healing debuff and apply ability block on all enemies. This is vital since anti heal debuff renders healers quite useless when they heal. Ability block will stop the annoying Chewbacca from taunting you, allowing you to burst down other enemies. On the downside, he is very fragile and can easily die to focus fire. Bring Ewok Elder or Old Daka to have to ability to revive so they will be ready to fight again. Verdict: Upgrade and max only if you run a droid or AoE team.